Overcast and misty, we bid adieu to Puerto Natales. Putting her in our rear-view mirror, we set our sights on our next destination, El Calafate, and another stamp in our passport – Argentina. We boarded Bus Sur bright and early for our 5-hour ride and as daylight approached, we discovered the sun and the promise of a beautiful day. We passed by guanaco, rhea, and even a couple of little grey fox. Most of the time we’ve seen the wildlife through our steamy bus windows, but, even if I’ve no photos to remember them by, we are still seeing them. 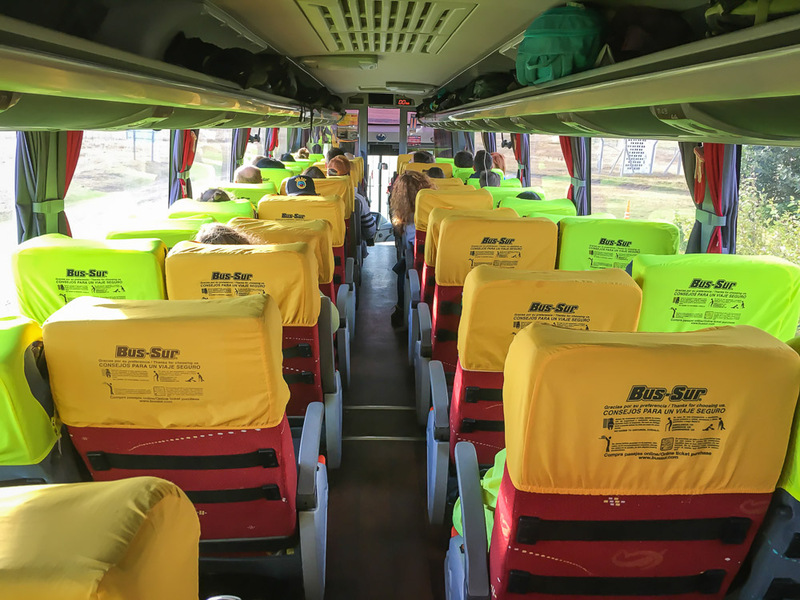 We pulled into the bus terminal, booked a couple of future bus rides, then hopped in a taxi and were whisked off to America Del Sur, our hostel for the next 5 days. We were greeted warmly; all the staff spoke English; and once settled, it was time to find a doctor to remove the duct tape and examine my finger. We were some of the oldest guests at America Del Sur but we felt totally comfortable. The constant hum of young, international voices was exhilarating. We met some remarkable young men and women: Julia from Moscow, Stella from LA, currently studying in Buenos Aires, Benjamin and Amil from Australia, to name a few. Breakfasts were plentiful, the on-site restaurant served great meals, and the beer was quite tasty. The large floor to ceiling windows in the common area looked out over the lake, as did the view from our room. 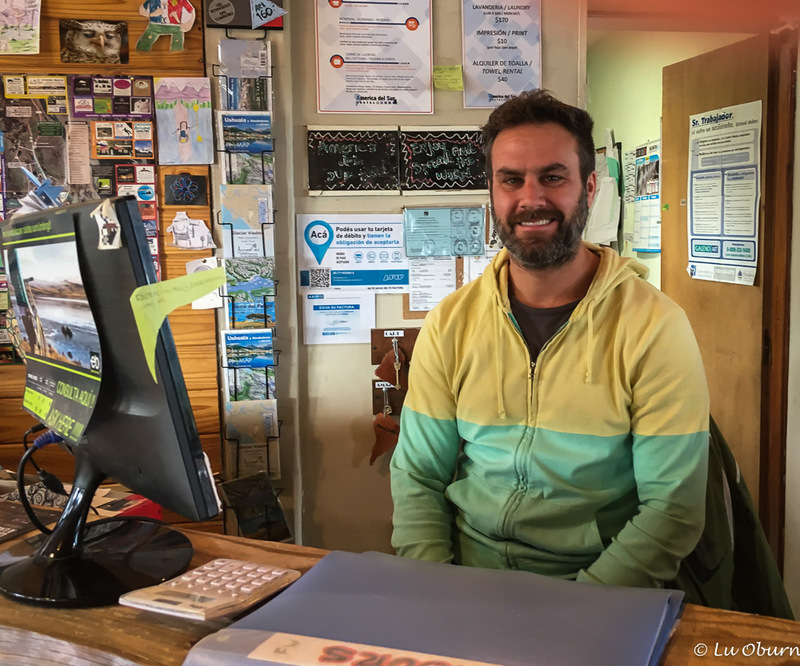 Knowing we had given ourselves a couple of extra days in El Calafate to chill, leisurely explore the town, and allow me time to write, kept a perpetual smile on my face. And with some sun in the forecast, life was good! I had hoped to visit Laguna Nimez Bird Sanctuary on the outskirts of town, said to have over 100 species of birds that visited or made this their permanent home. Unfortunately, it was closed due to flooding, caused by the very glacier we were planning to visit – Perito Moreno (more on that later). To say I was disappointed was an understatement, as I wanted to see the unique feathered beauties from this part of the world. Most of the towns we have explored to date in South America have found us looking like the pied piper as we strolled through town, collecting stray dogs along the way. Many don’t look emaciated or as if theirs is a hard life lived fighting for scraps. Perhaps some are just out for their daily stroll, like us. But they all seemed to have an invisible line they refused to cross and once we stepped over it, they were lost to us, until El Calafate that is. The day we walked across town to see the flood damage at the bird sanctuary found us collecting yet another stray, but this one stayed with us all the way back to the hostel. He was adorable and we found ourselves wanting to stick him in our luggage, along with a beautiful little kitty we found begging at the window to be let inside. Our little shadow during a walk through Calafate. Looks too healthy to be homeless. Terry wanted to hide this precious kitty in our room. I expected El Calafate to be a quaint little town but was quite surprised when we entered downtown and found a bustling town filled with boutique shops, outdoor gear stores, lovely cafes, tour companies, and a casino. 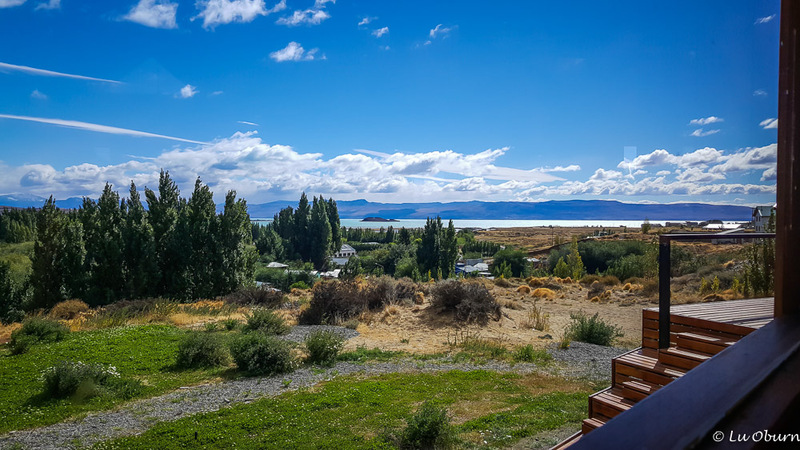 El Calafate is the poster child for the tourist boom in Argentina, with the population more than doubling in a decade, increasing real estate prices, surely a double-edged sword for the locals. The population now hovers at 25,000. We enjoyed our wanderings almost as much as America Del Sur. Park-like setting at the national park office. We had only one big adventure planned when we arrived in El Calafate, a visit to Perito Moreno Glacier, and the day had finally dawned. More on that later, as it deserves its own post. No, at the last minute we decided against it. That was probably the right decision for us, given the show we saw from the boardwalk. The restaurant is so lovely. I love the ceiling. So…there is no global warming? You can’t visit the Sanctuary because the glacier is melting…wonder what is causing that to happen. Very sad. I just love all the colors of the town. It gives it such a warm and welcoming feeling. Looks beautiful. Can’t wait to read about your glacier experience. Believe it or not Marsha, the flooding had nothing to do with global warming Marsha. It is a phenomenon that occurs almost every 3-4 years at Perito Moreno Glacier. I will be writing about that next. And yes, the colors of the town are fantastic. We really had a hard time leaving this area. The hostel is great. Not at all what I would have expected. Glad you had a comfy place to relax. Young people are so much fun especially when on the same adventure as you. We enjoy our younger friends that are RVing full-time. You forget age when you all have the same interests. That was an amazing cost to have your finger taken care of. You may have gotten it taken care of for $400 here…if you were lucky. Hope your finger is on the mend now. What beautiful photos of the Argentine town. So bright and fun. Can’t wait for the glacier photos!!!! The hostels have all been surprisingly nice but I have enjoyed this one the most to date. As for the medical costs, it is just one more reminder of what is not working in our country. El Calafate was a great place to have some downtime; just wish the bird sanctuary was open. Looks like a lovely place to stay and town to visit! Can beat the price of healthcare! We really enjoyed the vibe of El Calafate. It’s a shame we can’t get even close to these types of medical costs in our country. Nice looking hostel, but it is the cute little pooch and adorable kitten that stole my heart in this post! Glad your finger sounds as though it is on the mend, but sorry to hear you missed the birdwatching you were so looking forward to. The hostel was great but you are right Peta, those furry little guys really tugged at our heart strings. Hopefully we will still find some feathered beauties to photograph. Oh, I can understand why you were disappointed that the bird sanctuary was closed! I had the same thought as Marsha, that it must be caused by global warming. Interesting to read that it’s a natural, recurring phenomenon. Is there another place that you might see flamingoes? Even without the sanctuary, the hostel and town look colorful and inviting. It must have been hard to leave your cute little four-legged companions behind! So glad to know your finger is healing. America Del Sur made our stay in Calafate special, even without the birds. We have seen a couple of species since then, but not what I had anticipated. We may head north to the Atacama later on, so hopefully flamingos are still in the picture. I am loving your posts LuAnn! What did you think of El chatlen? I remember thinking how tiny it was and I like the feel. Has it changed? Thanks Nicole. El Chalten still seemed tiny to us as we easily walked the whole town several times, but it probably has changed since you were there. Tourism has helped it to blossom. We loved it! The hiking and the food was wonderful! Pudu Lodge, where we stayed, was a block from several of the hiking trails. Oh that is a place I really would love to go! I’ve heard it is beautiful LuAnn! It has been one of our favorite places to visit so far Nicole. Hopefully I will be writing about it soon. Such a colorful place! Your view was amazing! Languages a plenty has to be so fulfilling. We absolutely loved the vibe of this place…such energy! As for my finger, I think we are finally making some progress. Hopefully the splint will come off in another week. that hostal looks very inviting! i’m now anxious to roll back to the previous post and discover what the duct tape is about! I just told hubby this morning that I have such fond memories of our time at America Del Sur. Everyone was wonderful!